In a nutshell that’s what it comes down to. Having HOPE. All the time. Even when it seems too hard. My daughter Meghan gives me HOPE, and when she wanted to get prepared for “Rare Disease Day” on February 28th by creating lots and lots of denim ribbons… well, it was impossible to resist. It started out for her school. Then it morphed into my school too. Plus about 500 more. Meghan has had an affinity for the Global Genes Project since soon after our diagnosis. As a matter of fact that is the very denim ribbon image she had our friend use when he crafted her “one of a kind” necklace. (Well, now that Mom has one I guess there are two…) That very same necklace she hopes will transform the world’s image of rare diseases and give them a uniting symbol. I called our local paper. The reporter met with us for 2 hours Friday of last week. 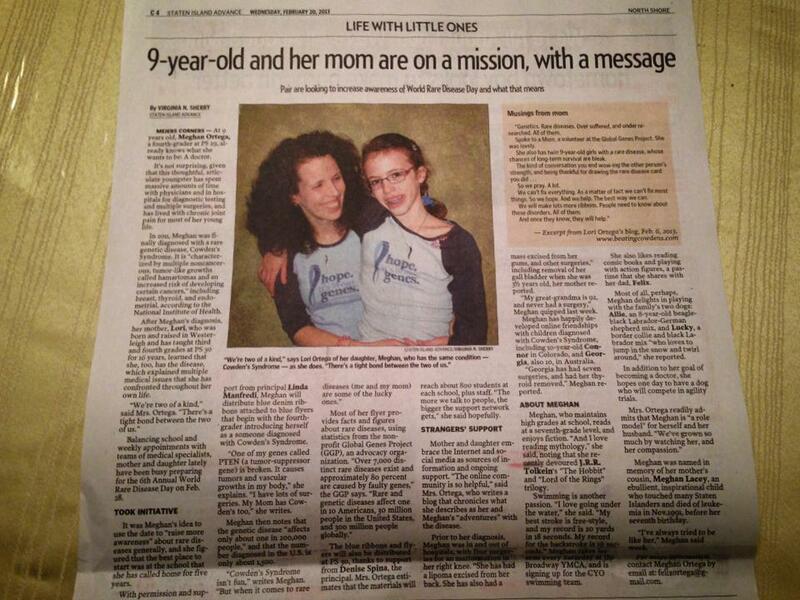 The article printed today. The link isn’t up yet – not the full one. Just the link for the photo. So, for now… this is all I have. 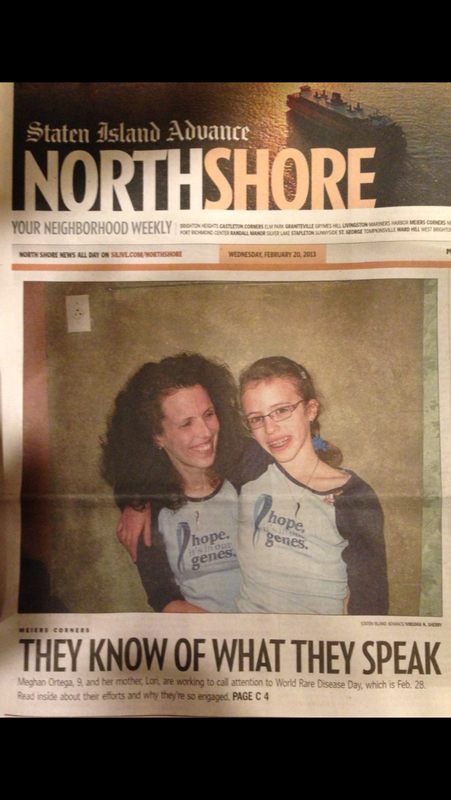 We were on the front page of the “North Shore” section. I will be sure to post the real link when I have it. But it is here and we are excited. Raising awareness in our hometown. My girl already wants to add a few schools for next year… Can’t stop this kid, and I wouldn’t have it any other way. Next This is the story… RARE DISEASE DAY! So wonderful!!! Proud of you both. I can’t wait to read it.